Barrett, David. Gideon Smith and the Mechanical Girl . Tor 2013. What if: The American Revolution failed. Summary: Steampunk novel set in an alternative Victorian era. Published: Snowbooks 2013 (1909679062BUY); Tor 2013 (0765334240BUY). 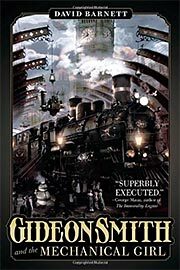 Series note: Sequel to Gideon Smith and the Mechanical Girl . Published: Snowbooks 2014 (1909679313BUY); Tor 2014 (0765334259BUY).